The collecting of cigar boxes is, like the collecting of stamps and coins, a specialized field of interest. Peculiar Postage, which previously appeared here on Dark Roasted Blend, was not intended as a detailed study of stamps, merely a look at some of the more curious examples. 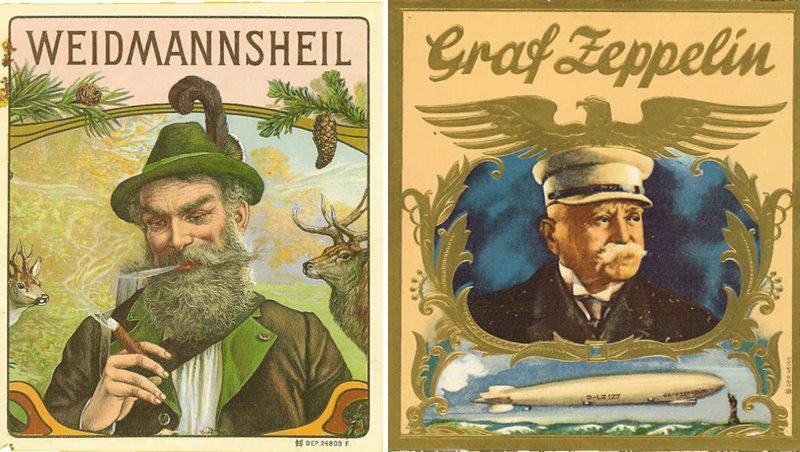 Similarly, the following article examines just a small selection of some of the most striking cigar box artwork from years gone by. This hardly seems guaranteed to drive sales, but you’ll be relieved to know that vanilla was used to make this pork packaging smell a little sweeter. Large chests that could hold around 1,000 stogies were next introduced, but by the 1830s, cigars were being packaged in sealed cedar boxes. Cedar apparently stops the cigars from drying out and matures the tobacco as well, but either way it sounds like a distinct improvement on the bacon bladders. Between 1800 and 1960, wood was used to create around 80% of cigar boxes. The most common variety, called “nailed wood”, comprises six pieces of wood nailed together and holds 50 cigars. By the middle of the nineteenth century, the industry had grown so much that it became necessary to distinguish one cigar brand from another. 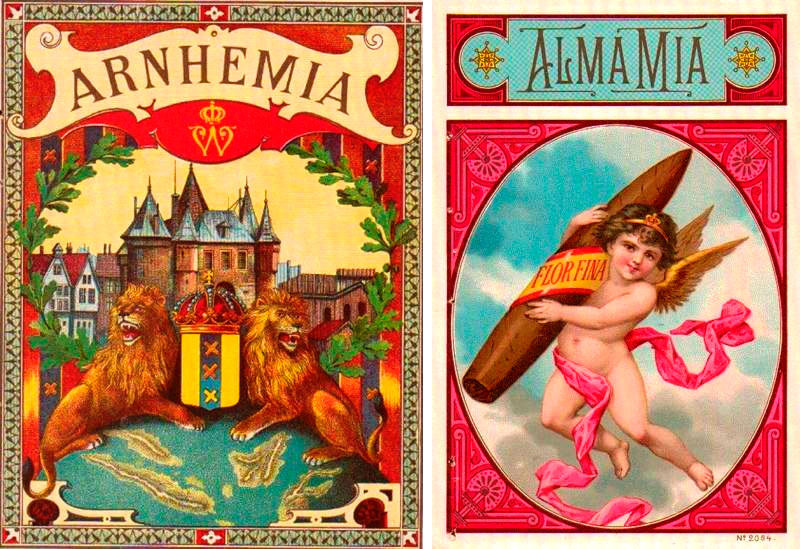 Labels began to appear featuring colourful illustrations, so that cigar manufacturers could set themselves apart from their competitors and attract more customers. As with any industry’s advertising, fashions and themes came and went. 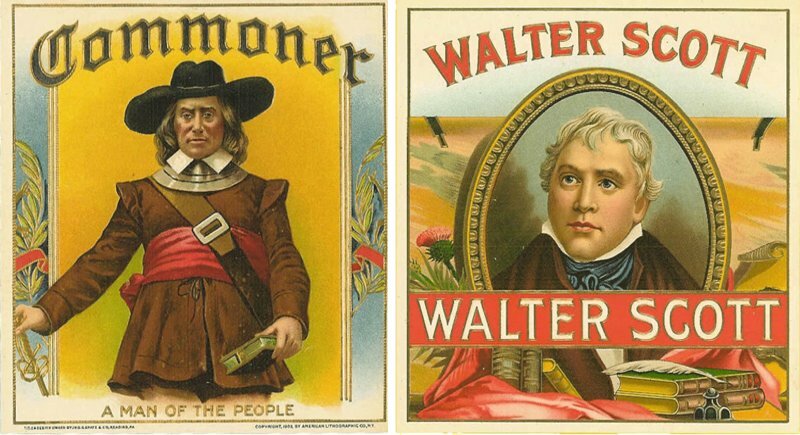 Famous people, politicians, mythological figures, pretty girls, children, patriotic figures and themes, animals, humour and more, were all used over the years to decorate cigar boxes. Here at Dark Roasted Blend, we spotlight just a tiny fraction of the multitude of labels produced during the golden age of cigar box art. Fidel Castro is of course always cited as one of the most famous cigar smokers. However, he apparently did quit some years ago, showing leadership in an effort to persuade his fellow countrymen to adopt a healthier lifestyle. Intriguingly, the picture on the left promotes Cuban cigars using another Castro, who I guess could be distant ancestor of the famous president. 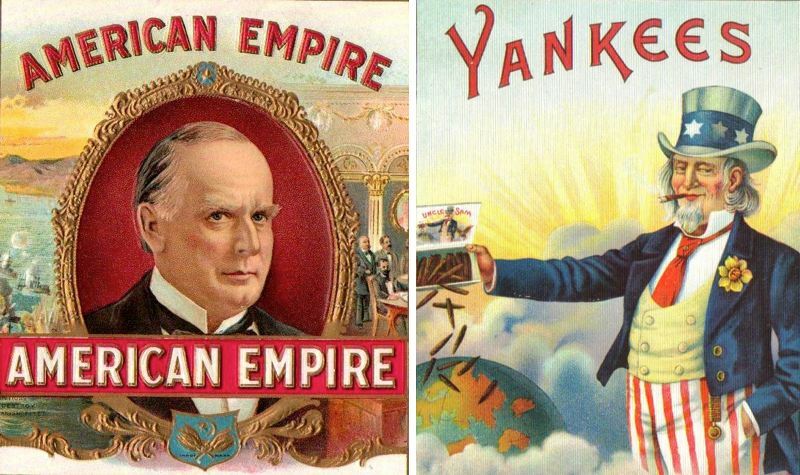 On the right, the union being celebrated by Uncle Sam and his friends concerns the events in Cuba at the time of the Spanish American War in 1898. This friendliness seems in marked contrast to relations between the U.S. and Cuba in more recent decades. Mr. Riley doesn’t exactly look ecstatic, but perhaps he could turn on the charm when needed for his customers, since they all evidently thought so highly of him. William Gladstone (1809 to 1898) was one of the best known of Britain’s Prime Ministers in the reign of Queen Victoria. Not sure how he felt about cigars, but he was very religious and introduced restrictions on the sale of alcohol and the licensing of pubs and bars, so he may not have spoken as highly of Mr. Riley, had the two men been acquainted with each other. With Rip Van Winkle offering a toast and hoping that we all will live long and prosper, you’d almost expect him to be giving that famous Mr. Spock Vulcan hand signal. Mr. Van Winkle, of course, fell asleep and awoke many years later, becoming a time traveler of sorts. The prophet (right) made a living by seeing the future as well, while staying firmly in the present as he doubtless consulted his crystal ball, books, star charts and other divination tools. 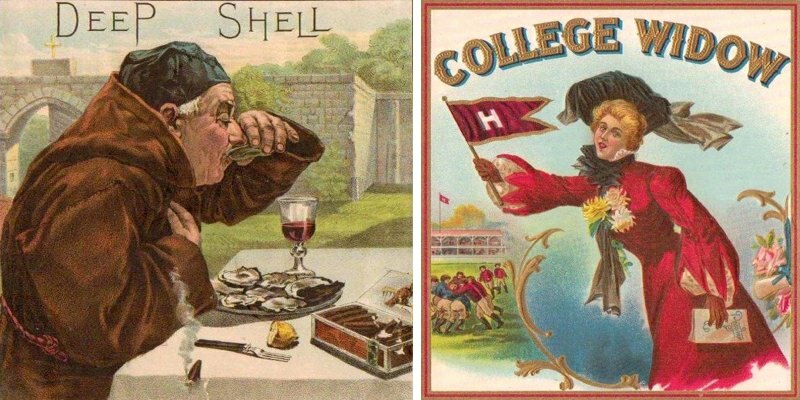 Today, it seems surprising, to put it mildly, that children were often used to advertise cigars in years gone by, as shown in these two examples. The dangers of smoking were not fully understood back then or at least not as publicized as they are now. Still, the boy in the right picture certainly doesn’t look old enough to be smoking, as he accepts a light from a girl who looks to be scarcely older than him. The left image features an angelic ideal of childhood, in order to somehow boost sales of Yankee Boy cigars. In stark contrast, the picture on the right maybe portrays a more realistic portrayal of American youth at the time, or at least as far as the criminal world was concerned. This streetwise kids gang is masterminding the robbery of a cigar store, bizarrely using an angry goat as a secret weapon. This is an interesting one on the left. As handy as it would be to have a reliable light for your stogie, it’s tough to imagine how you could actually do that while holding the cigar and the rapidly burning match in the same hand simultaneously. Maybe this person is about to light someone else’s cigar? On the right, we have yet another child appearing in a cigar promotion, but at least this time she just looks curious as to what grandpa is up to, rather than smoking the cigar herself.